To stay confident about your decision, nothing is more effective than connecting and learning from others who did the same. A success story will always fuel you to push forward even when the road seems impossible to follow. If someone did it, you can surely do it to! The second we made the decision to start Surviving Europe, we began our research. Any travel blog out there, we followed. We read their story, liked and looked through their Facebook page. The amount of blogs we came across of couples or individuals doing the same thing were ENDLESS. At that point, our decision was final. We will make this happen. 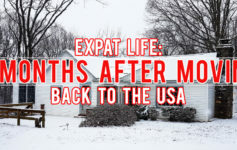 One of the most informative and inspirational blogs we found was Nomadic Matt. Matt had been on the road for 10 YEARS! 10 years of traveling and inspiring others to do the same. There was so much incredible information on his blog – we were both in awe. He was not only an accomplished travel blogger; he also had published books on how to traveling on a budget. 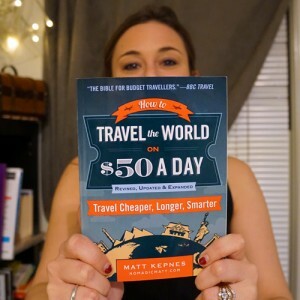 After spending a few hours reading information on his site, we realized the book tour for his most recent edition of How to Travel the World on $50 a Day would be coming to Washington DC next week! This book is the travel bible when it comes to traveling cheaply and affording adventures you thought would never be possible. What perfect timing. We quickly RSVP’d to his event and anxiously awaited Tuesday evening. The book tour started at 6:30pm, so I left work at 6:15pm and walked over to Kramerbooks in DuPont Circle. I thought maybe 20+ people would be attending the event, so there was no reason to arrive early. Boy was I wrong! This ‘small’ gathering was not small by many means. The room was completely PACKED. Not only was there nowhere to sit, there was nowhere to stand. Over 100 people crowded into this small bookstore to hear what Matt had to say. It was incredibly exciting to see the impact his story had on others. I had an amazing realization that if we work hard enough, Surviving Europe could achieve the same! Throughout his discussion, Nomadic Matt touched on many important subjects, but here are the ones I found most inspirational. There has never been a better time to be a budget traveler. We have more resources than ever available to us. And more are added every day. Do your research, use them and you will save. Don’t think of travel as something that’s out of reach. Such a simple yet effective statement. It is all about your mindset. If you doubt yourself, then you won’t be successful. Travel is something that everyone can experience when they work hard to make it happen. Sure, you need to stay on a strict budget, but when you have the opportunity to experience something incredible that you will never experience again, do it. Not doing it would go against your entire purpose. Take advantage of sign up bonuses. You can easily apply for a credit card, use the incredible bonuses to help fund your trip, and then put the card away and never use it again. This advice is something that I plan to research further. As long as you really do put the credit cards away, the sign up bonuses can be a HUGE benefit. This statement really stuck with me. Matt pointed out that you can always come back home and pick up where you left off. There is really nothing to lose, and so much to gain. Personally, I like to do things carefully and thoroughly instead of just hopping on a plane and hoping for the best. But this “just do it” mentality made me realize that I have to commit to making it happen. 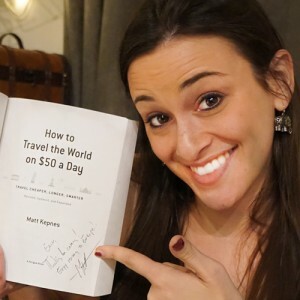 After the discussion ended, and when questions from the audience were answered, I waited in line to get my book signed by Nomadic Matt. I wanted to let him know how much his story inspired us at time where we had to push forward. And with a handshake and a note in my new book telling me to “Enjoy moving to Europe,” I left the book store that night ready to take on the journey ahead. With confidence and conviction.